The Spokane Home Guy Group is a growing real estate team in the Inland Northwest. 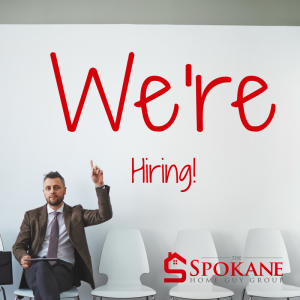 With offices in Spokane and the Tri-Cities, we’re rapidly growing and looking for talented people to help service our customers in Eastern Washington. We are a small-and-mighty team of driven, hard working individuals. We are learning based and willing to hold one another accountable. Those willing to invest in themselves and become licensed Washington Real Estate Salespeople. 3 years of sales experience (any industry), call-center okay. High School Diploma, though a college degree is preferred. Willing to participate in a thorough selection process. Selected candidates must commit to being coachable and learning based. This is a commission only position (although paid training may be available for exceptional applicants), we have team members making $60,000 to $100,000+ their first year, and certainly that in subsequent years. Daily Lead Generation, and reporting numbers and results. Finding and pricing properties for customers. Please no phone inquiries at this time.